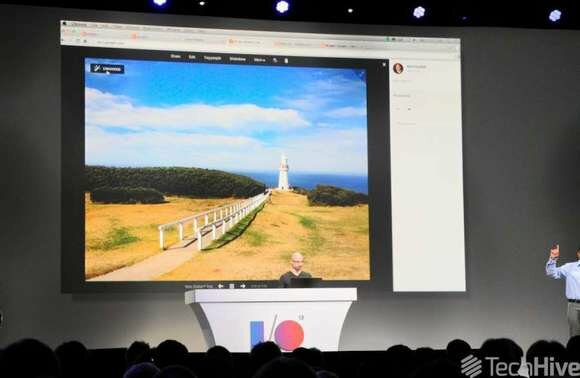 As part of the overhaul of its Hangout feature, Google has launched new photography functionality designed to take the labor out of on-the-spot shooting and editing in the cloud. The new features will roll out this evening. The fresh features enhance photos with three major points: Highlighting the best and most important photos, enhancing your shots, and applying special effects. Altogether, this spells backup, highlight, enhance, and "awesome" in the cloud. The Highlight feature takes the hundreds of images you shot on vacation and curates them, showcasing only the best of the lot. Its algorithm chooses the best images by eliminating blur, poor exposure, duplicates, and recognizing famous landmarks and smiling people. It also recognizes family and other important people in your life. Auto Enhance, which appears similar to one-tap functionality in other programs, works on tonal distribution, skin softening, noise reduction, structure, white balance, vignette, sharpening, red eye removal, and more. All you need to do is point the camera and tap the button. While it is automatic, you can turn the feature off or use it selectively. Auto Enhance works differently on people than on landscapes because it deeply recognizes the human face, according to Google. It can separate out eyes, teeth, glasses, and so forth, so that it does not product a grotesque looking exaggeration of facial features. Auto Awesome, says Google, takes a collection of images, and from them creates a new one that did not exist before. For example, it can take a stack of photos shot in burst mode and create an animation. It offers motion, but also pano, smile, HDR, and mix. If you have multiple portraits, they can be combined into a collage. If multiple pictures of same people in burst mode, they'll find where people are smiling and construct a new image from it.